St. Louis County prosecutor Bob McCulloch has threatened to release transcripts and audio from grand jury proceedings if he doesn’t get his way. According to the Associated Press, a prosecutor says he will move to release the transcripts and audio recordings of a grand jury investigation into the death of Michael Brown if the panel doesn’t indict Officer Darren Wilson. 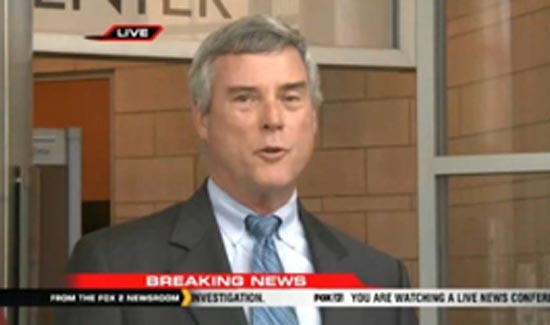 Spokesman Ed Magee told reporters that St. Louis County prosecutor Bob McCulloch ordered the proceedings be transcribed and audio-recorded. That’s very unusual with grand juries in Missouri according to sources. Should Darren Wilson be charged criminally, the grand jury testimony and recordings become evidence and as such could not be released. Another cop’s career (and possibly life-long dream) have been ruined by an over-zealous prosecutor who is pandering to a racial minority. If Wilson DOES return to the street, his motivation to be proactive in protecting the citizens will likely be ZERO – and with good justification. Darren: you are in my prayers, brother. You missed the point….! Police do not just shoot people. When they do the courts ask why. In this case the courts did ask why only because the citizens of Ferguson, MO said…ENOUGH, YOU MOTHER FUCKERS! KEEP DOING THIS AND WE WILL START SHOOTING YOU ! Is that fair?……… No……… But please drop the crap about brother and “in my prayers.” They do not pray in cop bars. IF Darren returns to the street he probably will not have a gun on his hip. That would not be a problem for most folk. For him…maybe. AND his “career” grows from day to day. The last “career” police job he has apparently ended when the whole force was disbanded for, in summary, being a band of blue bros. This guy needs to be looked at. Open ranks! Do not attempt to give unconditional love (support) to someone who needs unconditional scrutiny by someone besides other cops. Does the DA not have confidence in the panel to arrive at a fair decision, one way or another? His threat sounds likes judicial activism inappropriate to the office. You are correct………..Grand Juries are supposed to be secret, private………works in progress. ONLY because of the promise of secret and immune fro prosecution testimony can they compel people to testify. Beyond that I do not get it. The grand jury hands down indictments; charges for the courts to consider. So the suspicion is that, instead of reporting a need for a trial, the grand jury ignores evidence and cuts this guy lose? Is that it? The judicial activism is hard to see coming….you gotta look at the results. This is pressure……activism hurts more.